Q: Why would a strong applicant need the help of an admissions counselor? 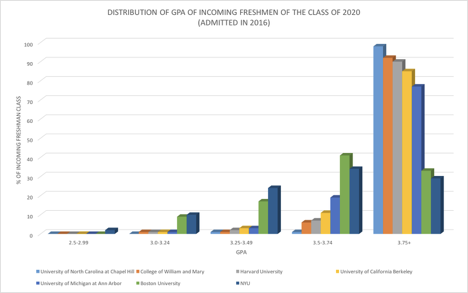 A: Every year top schools in the US receive applications from tens of thousands of students from all over the world (for example, 52,532 students applied to Boston University’s Class of 2017; a total of 101,655 prospective freshmen and transfer students applied for admission to UC Berkeley for 2016-17). They are, for the most part, academically qualified individuals, with strong grades, and excellent – sometimes perfect – standardized test scores. And that definitely improves anyone’s prospects of success. However, most schools have a “holistic” approach to their admissions decisions. This means that universities are not only looking for smart, disciplined students; they are also just as interested in finding engaged and enthusiastic individuals who will contribute to a diverse, dynamic, and stimulating learning environment specific to their campus community. In other words, being academically strong is necessary, but not enough to be admitted to top schools — and different schools are looking for different “soft” qualities.Many people think that schools are looking for a “perfect” student who checks a number of predictable boxes, and they set out to adjust their activities and interests to try to fit that perceived model. But the reality is far more complex. Every school has a different approach to education and a distinctive set of values that it wants to preserve and foster in its academic community. As a result, schools are attracted to applicants who prove to be good fits for them, in particular. The school-student fit assessment is a subtle but crucial one. It can be so important that a student may well be admitted to one highly selective school and not others, or even be rejected from less competitive ones simply because he or she is not the right fit, in the college’s eyes. A good counselor will help students develop an optimal profile in light of what each school is actually looking for. Our counselors at Expert Admissions bring their insider perspective on the admissions process to the table in order to help present the most compelling personal narrative for each applicant at each school while fully understanding the school-student fit. Q: What does an admissions counselor or consultant actually do? A: An admissions consultant can help students navigate the application process and maximize their chances of success at competitive universities. Because they know what leads to a successful application for admission at each school, counselors are ideally positioned to help an applicant strengthen his or her academic and personal profile, design long- and short-term educational plans, and submit the best possible application that doesn’t seem overly coached.Typically, an admissions consultant will help a student make academic and extracurricular decisions to improve prospects of admission (including planning summer and other extracurricular activities); choose programs and schools ideally suited to the student; and help prepare every individual item in the application dossier. Most applications will require submitting résumes, standardized tests, letters of recommendation, and sometimes interviews, as well – along with personal statements and supplements, which take the most time to prepare. Q: What makes Expert Admissions different from other admissions consulting services? A: Every Expert Admissions counselor has extensive experience as a former admissions officer at a top school in the U.S. From Columbia University (Barnard) to the University of Chicago, our counselors have spent years reviewing applications and deciding who gets in and who doesn’t. Because they’ve been on the other side of the table, they know best how to put together a successful application for admission that reads authentically on the admissions side.Admissions officers can easily detect a disingenuous or cookie-cutter application, which is why our counselors are keen on adopting a highly personalized approach to their work. Their guidance is meant to highlight the unique value and personality of each and every applicant. Q: Do you offer a guarantee of admission? A: While we don’t offer a guarantee of admission, virtually all our clients have been accepted into their top or second-choice over the last 12 years. Because each university’s admissions office has the final say in the process, it is misleading for an external consultant to guarantee admission. We believe that working with the most knowledgeable consultants is the best “guarantee” of good results. Q: What’s your track record? A: 99% accepted to at least one of their top 3 choice schools. Q: My son/daughter has a GPA of X, an SAT score of Y, and a TOEFL score of Z, what schools can you help him/her get into? Top 10? Top 30? Top 50? Source: The College Board (bigfuture.collegeboard.org). The data presented here does not reflect the official requirements of any particular program or school. Please be sure to check each institution’s website for specific requirements for admission. Q: How many students do you work with every year? How many counselors do you have? How many students does each counselor work with? A: Expert Admissions is a boutique counseling firm. We have three full-time counselors, and only work with a few dozen students every year, to make sure that each client receives highly personalized and intensive counseling services. Q: I see that you have counselors from Columbia and NYU. Do a lot of your students get accepted to Columbia and NYU? Do you help students get into other schools? A: Indeed, many of clients apply and have been admitted to Columbia and NYU. Yet our admissions counseling is just as effective for those as for virtually every other school in the U.S. Our counselors help students get into schools all over the country, not only Columbia or NYU, and they travel throughout the year to become personally acquainted with colleges and universities across the country. This way, our counselors remain up to date on the latest trends and changes in higher education while they develop new and maintain enduring relationships with admissions officers. Q: Okay, I think I can benefit from working with Expert Admissions. When should I start? A: It’s never too early to start! We can begin to work with a student at almost any point before applications are due, and as late as the autumn of the application year. However, the earlier we begin to work with a student, the more our counselors will be able to help strengthen a student’s profile.In the case of undergraduate or college admissions, because universities look at everything you’ve done (and haven’t done) throughout high school, it is common for families to start working with us as early as 9th grade. For transfer students, we usually begin to work around one year before the application for transfer is due. This is important because applications for transfer depend heavily on your curricular and extracurricular choices (and performance) at the institution where you want to transfer from. In the case of graduate degree programs, we often advise our clients to begin working on applications at least one year in advance. Doing so makes the process more comfortable, maximizes standardized test performance, and allows more time for in-depth research on each program and institution of interest. Q: How can I work with a counselor in New York City when I live thousands of miles away? A: Expert Admissions has clients all over the world, in many different time zones. Thanks to modern telecommunications, physical distance has never been a restriction for us. Our admissions results have proven just as strong with long-distance counseling as for clients who meet with the counselors in person. In fact, even some of our clients in Manhattan decide to work with us via Skype to save commuting time!For our international clients, we always make our best effort to adjust our schedules to time differences in order to facilitate their work with us. A: We always ask students to write their own essays both for reasons of professional ethics and because there’s no better way to capture their authentic voice and personality — which is exactly what admissions officers are looking for. That said, we provide extensive help at every stage of the writing process, starting with brainstorming, putting together a first draft, rewriting (when necessary), and going through multiple rounds of revisions. Students often struggle with finding their own voice for the essay, and our counselors have all the experience to help them find it. The most effective essays convey authenticity but also show that a student is the right fit for a particular university. Our counselors’ knowledge about what different institutions value and look for contributes enormously to successful personal essays and statements of purpose. Q. I’ve seen tons of agents who guarantee admission and even write a student’s essay. How is Expert Admissions different from those agents? A. Expert Admissions is an independent admissions consulting firm. Agents typically take commission by sending students to schools that tend to be less selective or where the applicant already has a high chance of admission to begin with. Unlike agents, Expert Admissions has no financial ties with colleges or universities and our counseling team helps students improve their chances of admission into more competitive institutions. We only work in the best interests of our students and their families. As a result, whenever we recommend a school, we do so only on the basis of our professional assessment of a student’s fit for that particular institution, never on the basis of economic incentives provided by the school.Secondly, we don’t make false promises so we cannot guarantee admissions results. Our expertise and experience are the best guarantees of good results, as reflected in our track record over the past 12 years. Finally, it is the policy of U.S. admissions committees for a student’s personal essay and supplements to be his or her own work. While we spend a lot of time helping our students brainstorm, draft, and revise their essays, the end-product always reflects the authentic voice that admissions counselors are seeking. We are always mindful that a good essay needs to match the student’s academic profile and retain the voice of a 17-year-old when applying to college (or the appropriate age when applying to boarding school or graduate school). Our credibility and good standing with admissions offices is the direct result of the high ethical and professional standards we apply to our work with each and every student, and the many students we send them every year.